This session covers the handling of fixture data, programming looks and chases and understanding effects. We will also look at laying out the MagicQ to playback our show – in this case, a three piece band set to be operated “on the fly”. 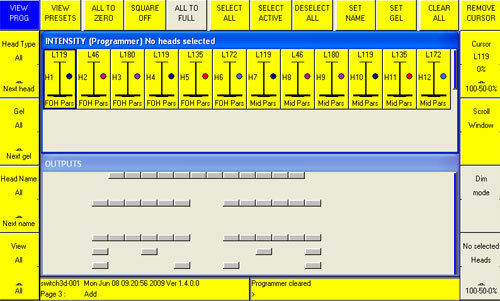 Note about programming: The MagicQ is a programmer based console, where data is entered into the programmer and then dumped into a scene or chase step. A programmer style desk records in a different way to an Output recording control. 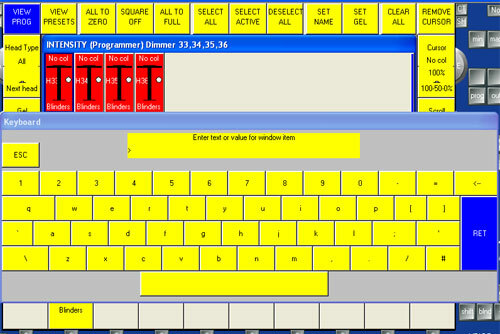 A traditional style of entering fixture data, command line programming involves typing instructions into a keypad and hitting ENTER to action them. You can type in a channel number, followed by an @ symbol, and then an intensity level – > 10 @ 50 ENTER sets fixture 10 at 50% and enters this into the programmer. On a laptop without a separate number pad, command line entry is a bit fiddly. As we are only controlling conventional dimmers today, using the Intensity Window is quite an attractive option – it’s a bit like having traditional fader banks. Open the INTENSITY [INT] Window and you will see a graphical representation of faders with Name and Colour information. You can grab the slider and adjust the level which enters the information into the programmer. Filtering the window by Name or Colour helps reduce the number of sliders on view at any one time. Using the Auto groups set in Part 1 of our tutorials, we can easily select fixture groups and adjust their level as a group using the bottom right encoder or use it’s softkey to toggle between 100% – 50% – 0. It’s possible to use the GROUP area to toggle multiple group selections, to do this might requires it to be set. SETUP > Prog > Select Mulitple Groups. Adjusting individual fixtures in a group is often achieved by using the NEXT HEAD or PREV HEAD buttons to bump through the fixtures and adjust the levels with the encoder. Selecting fixtures via the virtual plan we created in the OUTPUTS window, either individually or dragging a multiple selection, we can set the levels using the bottom right encoder. This is handy if you know where the fixture is and just want to tweak it – no need to know which number it is. Having seen some methods of entering data, we are going to create some simple memories for the band using each one. Let’s start by creating a look which is the Beam Fans at 100% using the command line. Make sure that you are working in the Custom Prog workspace we created and clear the programmer with CLEAR [CLR]. Type 13 > 24 @ # (# is Full on the PC) and watch it appear in the command line before pressing ENTER. You will see the back PARS turn blue on the plan and the data appear in the programmer. To save it to Playback 1, hit RECORD , type in Beam Fans and select the S button above the first fader. CLEAR the programmer and try out the fader. You might find that there is a fade in time when you raise the fader. In that case, you can double click on the S button to open the CUE Stack window where you will see the Beam Fans cue information. Set the fade to 0.00s in the field but selecting it and typing 0 ENTER. Now, you have the fade time controlled by fader only. While we are in the CUE stack window, we can set the default fade time by choosing View Defaults (top) – > Step Times and setting them all to 0s. CLOSE the CUE stack window. 1 > 24 – 1 > 13 + 13 @ # which is an over engineered version of our previous command. There are some more details on the command line on the useful shortcuts sheet by Cham Sys. Personally I am not that keen on command line entry, especially not while using the PC software. Let’s set up a custom view to help us work in the intensity window. Close all Windows with SHIFT + CLOSE and re open the OUTPUT window in the bottom half of the screen. Open the INTENSITY (INT) window and size it to fill the top half of the screen. Now we can use the Intensity sliders and see the result so save that view – RECORD > Type in INTS then CRTL + select an unused view button. Grab a slider and see it working on the OUTPUT window. What you can’t see is that values are also being placed into the programmer, the top of the INT window says Intensity (programmer). Any fixture currently in the programmer turns red, even if you wind the fader to zero, the fixture remains in the programmer at 0%. With conventional fixtures, this doesn’t matter to much, with complex fixtures like moving lights – it does. Remove fixtures from the programmer by selecting their slider, then Remove Cursor (top right). Changing the INT window to View Presets (top left) displays faders like the real faders on a conventional lighting desk. These are not related to the programmer and are good for controlling specials while busking a show, setting fixed levels for houselights or controlling fixtures you don’t want programmed, if the crew is focussing for example. Go back to the Programmer intensities with View Prog. With the INTENSITY window set to MAX, we could see all 36 dimmer channels but with only half the screen to play with we need to be able to zone in on the faders we want. This is where the labelling and colour information comes in. The left hand encoders are used to set different filters to the displayed faders – Head type (we only have Dimmer on this show), Gel, and Head Name. The bottom left softbutton toggles back to view All. Using these filter, we will set up submaster for out 2 band spotlight positions. CLEAR the programmer and scroll through the Gel filter until you find L202, our spot colour. Push up the SR spot slider to 100%. Save that spot to PB8 using RECORD, typing in SR Spot and choosing the S button. CLEAR the programmer once more and repeat with the two DSC spots and save onto PB9. CLEAR again and finally save the SL spot onto PB10. Toggle the window filter back to All with the bottom left encoder. Next we are going to record a Blinders memory, so scroll through the Head Name filter until you hit Blinders. This brings up our 4 Blinder faders. Choose Select All from the top row of softbuttons and use the bottom right encoder (Selected Heads) to bring them to 100%. Hit RECORD then the S button on PB2. You will notice that we didn’t name the look before choosing the destination and that it now has a number like CS ##. We can name it now by pressing SET which pops up the QWERTY keyboard before typing in the name and hitting enter. Naming things after they have already been recorded, including custom views, is done using this SET method. Next up, we are going to create a colour wash using the Group method and adjust individual levels using NEXT / PREV. 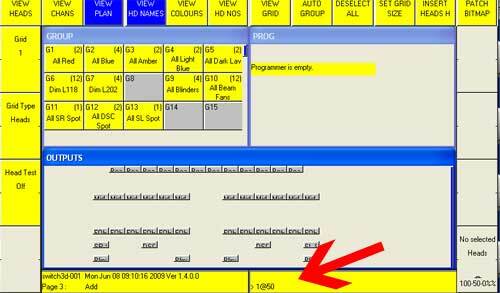 CLEAR the programmer and return to our Custom Prog window using CRTL + view softbutton. In the GROUP windows, select All Red and bring to Full using using the encoder. Now, we want the backlight to be stronger than the front light. Hitting NEXT HEAD selects just the FOH Pars and turns the others off (Highlight mode) but we want to adjust them while seeing everything so turn off HIGHLIGHT using the hard button. Knock 20% off the FOH Par channel then hit NEXT again and take 10% off the Mid Par channel – Hmmm, the whole thing could do with lifting a touch, hitting ALL reselects the entire group and we can wheel on another 5% before RECORDing it to a playback as RED WASH. So, the whole group incremented relative to their starting value and are now at 85% and 95%. Record another look, this time a Cold Wash using both Dark and Light Blues by toggling each group on and controlling them in tandem. If you can’t multi select them, make sure that Enable Multiple groups is set in the SETUP / Prog menu as mentioned earlier. The last thing in this section is to create an Odd/Even Chase on the Beam Fans using the selection tools. CLEAR the programmer. 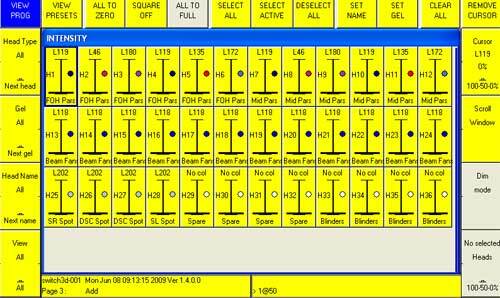 Select All Beam Fans from the GROUP window and click and hold ODD/EVEN (right), selecting ODD from the menu. Take the selection to 100% and RECORD “Beam Chase” to a spare Playback. CLEAR the programmer and repeat using an EVEN selection, RECORDing the programmer to the same fader. Hit CLEAR again. By saving two looks to one fader, we have started a Cue Stack – a list of cues that run in sequence. When the MagicQ creates a cue stack, it defaults to being a chase that advances automatically rather than a theatre style cue list . Fire the chase of by raising the playback and you will see the chase running in the OUTPUT window. As you are probably keen to mess about with the chase timing, double click on the S button of the playback and fit the Cue Stack window to the top half of the screen. Play about with the Chase Xfade and Chase Speed until you are happy. The last method of entering information into the programmer we mentioned was using the virtual plan. 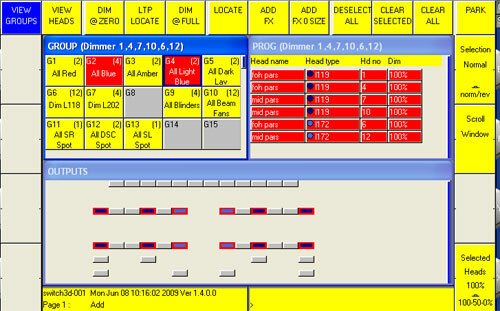 This is pretty straightforward, you select fixtures in the OUTPUT window and set the levels using the encoder. Have a play around with that too, if you like. We can use Move to layout our playbacks exactly how we want them. Try moving a currently recorded playback : MOVE [MVE]- > “S” button of existing playback – >”S” of a free destination. Stacks can be moved between playback pages and this method can be also be useful to reorder playbacks on a full page, temporarily parking a stack on another page to free up some space on the current page before shunting playbacks around. Copying stacks can be used to create other instances of a stack or to create the basis of new programming. The difference is between a Linked Copy or an Unlinked Copy. Linked Copy – The default Copy function, the Linked Copy takes the data from one playback and copies it to another. Altering any instance of a playback changes all copies. This is used for making the same cue/stack appear elsewhere on the playback and only one instance needs editing. Action : COPY – > “S” That – > “S” There. Unlinked Copy – An Unlinked Copy takes copies from the original playback and creates a new one. Edits to the original are not reflected in the copy, nor vice versa. Unlinked copies are useful for creating a whole new cue or stack, using existing data. Action : Shift + COPY – > “S” That – > “S” There. Now we have nearly filled up a page worth of playbacks, we better take a while to understand cue storage on the MagicQ. When we created a look and stored it to a fader we actually did two things – saved a cue and assigned it to a fader. Each cue created is stored in the Cue Store, a bit like a back cupboard where things can get lost. Deleting a cue from a Playback using REMOVE + S button actually only removes it from the fader, the cue lives on in the Cue Store and can only be completely deleted from there. This is good news if you accidentally delete a look from a fader and it turns out that you wanted it. Delete the cue RED WASH from it’s playback with REMOVE [REM] + S and confirming at the popup. Next, open the CUE STORE (right) window. You will see all the cues recorded in this show file, find the RED WASH cue and copy it back to it’s playback with COPY > RED WASH > Playback S button. There, no harm done. You can check the contents of a cue live on stage by using Test Cue (top) in the CUE STORE window. When we created the Beam Fan chase, we made the first Cue Stack – a series of connected cues. Cue Stacks also have their own cupboard, found by pressing STACK STORE and this can be used to pick a stack and assign it to a fader in the same way. You can test the stack in the cupboard too. NB. If a cue is part of a cue stack, it cannot be deleted via the store while it’s stack still exists. But let’s not get too hung up on that now. 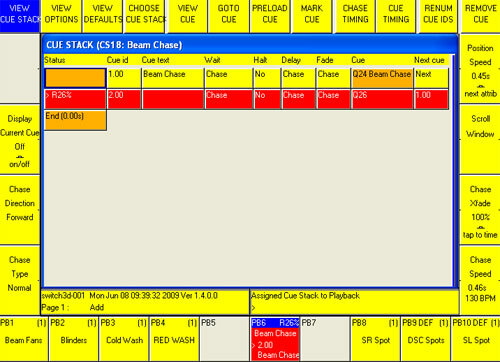 Create a Cue Stack to be used as a chase. Next time, we will be looking at creating another page of playbacks with other types of memory including a theatre style cue stack, FX engine driven dynamic effects and setting up the desk to run our show. Creating another page of playbacks just requires a page change using the NXT button (bottom left) and recording new scenes to the empty slots. A theatre style cue stack is stored like a chase, with multiple records on one playback. The timing is changed by double clicking the S button to open the Stack window and choosing Cue Timing (top) instead of Chase Timing. 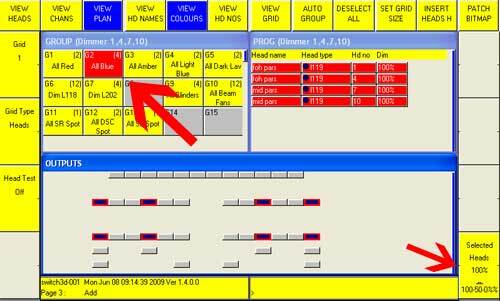 While in the Cue Stack window, take a look at the data fields for each cue such as Delay, Fade etc. The FX engine is applied by choosing a Group like All Beam Fans, Add FX (top) and choosing a fade like Ramp ^. Adjusting the encoders marked FX gives you direct control over different elements of the effect such as timing, spread and size. See if you can work out what they all do, using the output window to view the results. Do You have any ideal for Robe Cyber cue Or Sunlite PC base lighting control software tutorial… i still wanted to learn more on control time. Thank you and i have learn a lot more on lighting program on this web site. These tutorials have been a great help as I’m trying to get into MagicQ, having just got myself an Enttec DMX USB Pro adapter. Any idea when the next tutorial will be published? Just started working with MagicQ and learned a lot in these tutorials : thanks a lot !!! … hope to find one soon about working in MagicQ with multi dmx channel devices(led pars, ADJ Revo, …).